Advantages of this product line are: free view out, shading above the window, linear architectural element. 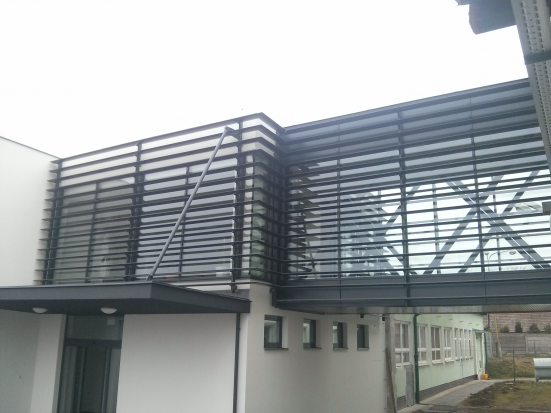 Sun protection blades Alaris Umbra are ideal choice for horizontal shading because of the low weight of the louvers which is important when used as a part of a longer construction. Alaris Umbra is suitable everywhere where an elegant impression is required. Connection of the blades is done by consoles which are attached to the construction. The beams are mounted to the console. The position of the beams is determined by locking screws. 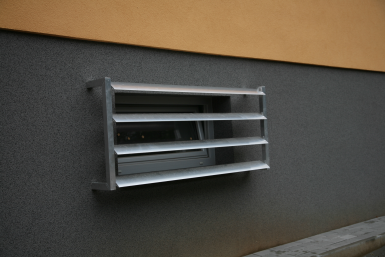 Louvers Alaris Umbra (angles 45° or 60°) are clicked on the holders which are mounted to the beams. For cover of beams, 2 types of covers can be used. Cover SP.72 covers beam head and cover SP.73 serves for attachment of front frame profile AU. 160 which forms continuous line and emphasises overall impression of sun protection blades. The diagram of the dependence on beam lenght (see detailed information) must be taken into consideration while designing the sun protection blades. When the beam lenght is more than 1500 mm, there is a necessity to mount the diagonal support in the form of the rod which is anchored into the facade. Product Alaris Aero was designed with the aim to get stiffer and more massive construction which would be able to handle a larger load and to bridge longer distances. Aaris Aero looks monumentally thanks to its proportions and therefore it ensures an astonishing appearance of the building. 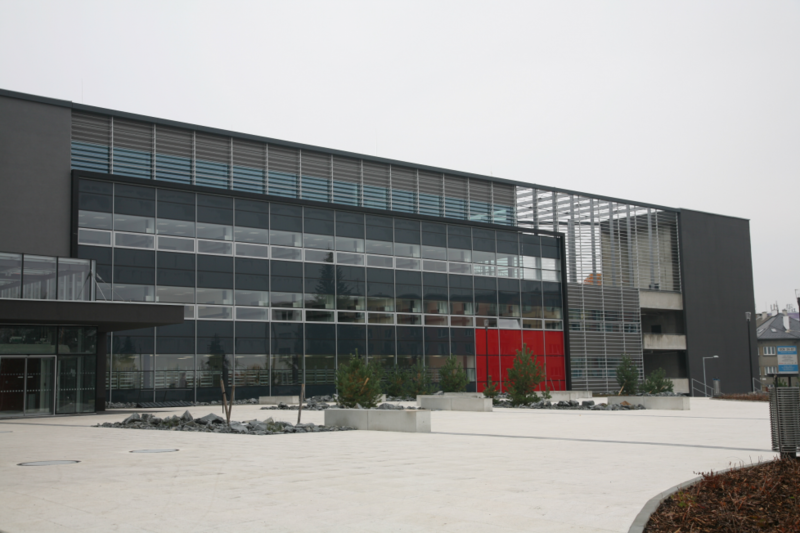 The advantage of system Alaris Aero is the great variability of inclination of its louvers - 45°, 60°, 75° and 90°. The variability is given by rail Vario Click, which is also the support for simple construction of louvers into the rail and it protects agains longitudinal displacement. Movable Alaris Aero sun protection blades are suitable for variable possibility of shadowing. Connection of robust louvers together with supporting structure and great variability of inclination of louvers constitutes the unique product Alaris Aero. System of the movable sun protection blades can vary the intensitiy of shading depending on the current climatic conditions and according to the requirements of the customer. During summer they can protect against penetration of sunlight into the interior of the house. In contrast with colder season, the sunlights can be used for heating the interior and thanks to this, the heating costs can be reduced. Each louver is attached to the fixed point and rotates around it. Thanks to the rod, the rotation of the complete sun protection blade is synchronous.